Potassium is an important mineral for most fruiting crops, especially in the final stages of fruit development. It is essential for sugar transfer, fruit quality and taste, as well as oil development in nut crops such as macadamias. OmniRed has been specifically tailored for situations such as these and crop timings requiring lower P and higher K.
OmniRed is perfect for fruit finishing, macadamia side-dressing, later side-dressing in potatoes, and for certain soils where P is excessive. 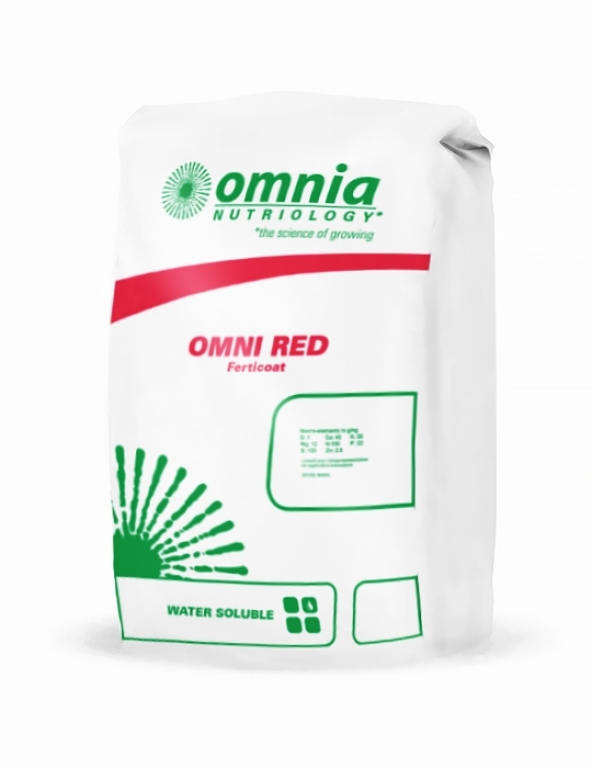 As with all Omnia compound fertilisers, OmniRed is a high quality granule containing NPK + trace elements and is also available with Omnia’s FertiCoat coating. Specifically tailored for crop timings requiring lower P and higher K, Omnired is a high quality granule containing NPK + trace elements and is also available with FertiCoat coating. See bag for application information.